Kennedy launches this intriguing investigation of twelve giants of western thought with an analysis of Augustine's description of the 'two cities' - the secular and the sacred. Modernity has rejected their co-operation. The Protestant Reformation witnessed the collapse of the spiritual unity of the church. John Locke registered this when he observed that: "everyone is orthodox to himself," and therefore government should restrict itself to material concerns. Also tracing the thought of Rousseau, Kant, Hegel, Marx, Dostoyevsky, and Solzhenitsyn, to conclude Kennedy invites a rediscovery of our spiritual roots which secularism has obscured. Secularism and Its Opponents by Robert E. Kennedy was published by Palgrave USA in December 2006. 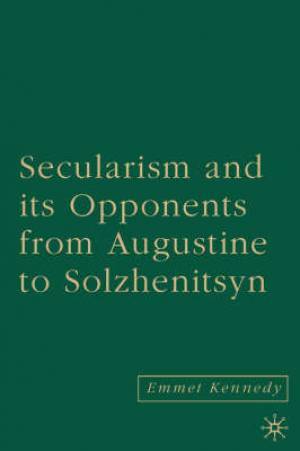 The ISBN for Secularism and Its Opponents is 9781403976154. Be the first to review Secularism and Its Opponents! Got a question? No problem! Just click here to ask us about Secularism and Its Opponents.